VMware has signed deals with Verizon (s vz) and Telefonica (s tef) to offer its mobile virtualization products on phones provided by the operators. The net result of this deal is that employees who want to combine their work phone and their personal phone will soon be able to do so with the aid of the VMware (s vmw) Horizon software on their phones. As is usual when dealing with mobile operators and corporate IT, some caveats apply. So far only Android (s goog) devices will work with the Horizon hypervisor with VMware unable to offer the benefits of a hypervisor-enabled virtualization on Apple’s iOS devices including the iPad and iPhone for Verizon. Steve Herrod, the CTO of VMware, said in an interview that’s he’s happy to do it when Apple decided to let others play around with its operating system. Meanwhile he reiterated that eventually he hopes to get VMware’s Horizon product written into the Android code. While he’s thinking big, he also avoided stealing the carriers’ thunder. So he couldn’t tell me when Verizon or Telefonica would launch the dual-mode devices, or much about how they planned to price it or sell it. He did say that Telefonica planned to offer it as a service for corporate clients, which means that Telefonica will host the management software that will control the access to the corporate side of the phone and offer it as a service for enterprise clients. Telefonica will also be offering two phone numbers for one phone, although Verizon will not. So far Verizon will offer the service on LG phones, although VMware also has a partnership to put its hypervisor on Samsung devices as well. 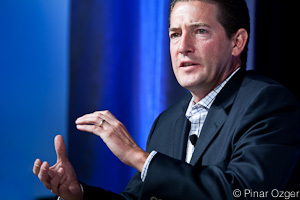 When asked, Herrod said he expected more partners to be announced before carriers actually launch the service. The hypervisor has to be put onto the devices before they ship from the manufacturer, although a user doesn’t have to enable it. For more on the use cases associated with having a virtualized mobile phone, check out the conversation I had with Herrod during Mobilize. Essentially it gives the user one device, while giving the corporate bosses a sense of control and security around what apps, data and information can be accessed and stored on the device. Herrod claims that the software has “minimal, if any” impact on the phone’s battery life or responsiveness.